There was a time that I never would have considered this. But with Google, Facebook, Twitter and YouTube all censoring conservatives now, banning them and manipulating exactly what we can see and say, I’m sad to say that I agree with Tucker Carlson on this one. It’s time to regulate not only Google, but social media. We’d have to be careful though in the regulations and make sure free speech is protected, or it would be a nightmare. Regulate them like a utility and stop the abuse of our right to free speech. It’s a terrible choice we are being forced into here. The Internet should have been a free speech playground that of course still obeyed the law and did not protect criminals. But what it has been turned into is a political weapon by Google. Imagine even one week without Google or social media now. It’s literally something we have to have to work and function. It’s no longer a convenience for many, but a necessity. Many conservatives who have worked hard to build businesses on these platforms have had all their work yanked out from underneath them, destroying their businesses. And most of the time it’s literally for no other reason than politics. This can’t be allowed to continue. It’s now obvious that Google cannot be trusted to do any of this. Why should a company that shuts down free speech for political reasons have the power to dictate what the world knows and thinks? Well, of course it shouldn’t have that power. Google’s long time motto was, don’t be evil. Today it uses do the right thing. We should have seen this coming. Those are super villain slogans if there was ever such a thing. None of this can continue. In Europe, Google has already been hit with a nearly $3 billion fine for violating antitrust law. Congress here and the Trump administration should go further than that. Since it has the power to censor the internet, Google should be regulated like the public utility it is to make sure it doesn’t further distort the free flow of information. To the rest of us, that needs to happen immediately. Too bad it’s come to this. A lot of us trusted Google not to be evil. Silly us. 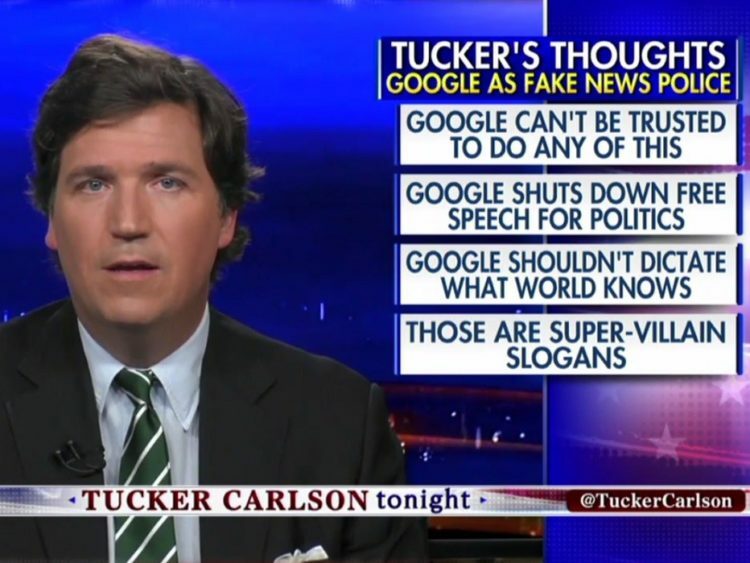 Tucker Carlson convincingly made the case to regulate Google like a public utility and I think the time has come for that. I hate adding more regulations and government to the mix, but these companies have left us little choice. They own that market and monopolize it now, which is very, very dangerous. Carlson made those remarks after learning of Google’s dismissal of James Damore, a software engineer that authored a memo laying out his views on the political culture at his company. He did so after employees were told they were free and safe to voice their opinions. Evidently, not so much. After the memo circulated, it was found out who wrote it and employees demanded Damore be fired and he was. Google issued an Orwellian statement that was the very opposite of what they did: “Part of building an open and inclusive environment means fostering a culture in which those with alternative views, including different political views, feel safe sharing their opinions.” Google is now the most powerful company in the world, followed closely by Facebook and then Twitter and YouTube. All are leftist and all are censoring conservatives. Instead of ‘don’t be evil’, Google has morphed into ‘don’t be free and open anymore’ and by all means ‘don’t be fair and inclusive’. So much for diversity… time to regulate Google and social media and restore freedom to all who use them.